The Museum of Contemporary Art Tokyo presents Japan’s first major retrospective of the work of Oscar Niemeyer (1907–2012), father of Brazilian modernist architecture. As Brazil and Japan celebrate 120 years of diplomatic relations and Rio de Janeiro prepares to host the Olympics in 2016, Oscar Niemeyer: The Man Who Built Brasilia will showcase a century of this great architect and son of Rio. The unique creativity of Niemeyer’s designs for prominent buildings in his native Brazil earned him tributes both at home and abroad, including architectural awards such as the Pritzker Architecture Prize, Japan’s Praemium Imperiale, the American Institute of Architects Gold Medal, and the International Lenin Peace Prize. After having designed the Pampulha architectural complex, Niemeyer worked with Le Corbusier in designing the United Nations Headquarters in New York (1947) and the buildings of the new capital Brasilia. The triumph of Brasilia took on historical significance above and beyond its architectural brilliance, raising Brazil’s international profile and earning its unique capital World Heritage status in 1987. In 1964, during the country’s military regime, Niemeyer moved to Paris and based his practice there for the next 20 years before returning to Brazil with the redemocratization in 1985 and continuing to work prolifically, right up to his death in 2012 at the age of 104. Niemeyer, who always insisted on the importance of art in architecture, had been gifted at drawing from a young age, and found that if he looked at his pictures for long enough, they began to feel real. Niemeyer’s designs are suffused with the boldness and freedom of freehand drawing, retaining the physicality with which these traits are converted into spatial form. Distinguished by organic, dynamic lines likened to the curves of a woman’s body and the natural environment of Rio, they realize a harmonious blend of vitality and modernist geometry. His concepts and style have inspired many Japanese architects. This exhibition will present a comprehensive overview, incorporating plans, models, photographs and video footage of 10 of his major buildings. Newly made models in various sizes will allow visitors to experience for themselves the dynamism of his designs. The exhibition space is designed by SANAA (Sejima and Nishizawa and Associates), architects greatly influenced by Niemeyer. The exhibition will present a comprehensive overview, incorporating plans, models, drawings, photographs and video footage of ten of his major buildings. Models in various scales (from 1/3 to 1/300), specially made for this exhibition, will reveal the beauty and the organic shapes of Niemeyer’s architecture. Among the highlights will be the reproduction of Ibirapuera Park (scale 1/30) in the Museum’s 500 m2 atrium, which will allow visitors to experience the dynamism of his designs. Another centrepiece is Niemeyer’s original 16 meter-long free-hand drawing. The exhibition also includes a video footage showing Oscar Niemeyer’s day-to-day life and revealing the secrets of his creativity, and detailed documents of the construction of Brasilia. The exhibition is the first event of the Brazilian Cultural Festival in Japan 2015–16. 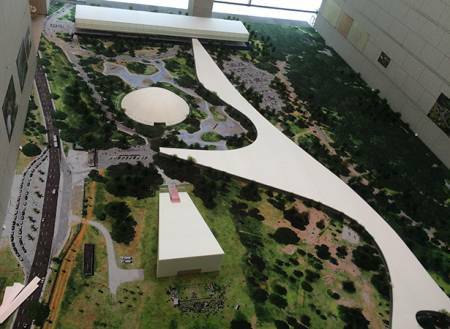 Image: Oscar Niemeyer, Ibirapuera Park Model (scale 1/30). Exhibition view, The Man Who Built Brazilia, Museum Of Contemporary Art Tokyo, 2015.